Sporty and Elegant…and excellent for traveling the world. 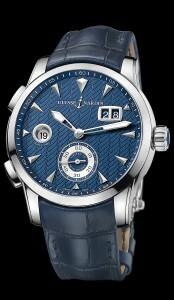 Stainless Steel, 43mm case, in house Ulysse Nardin movement, blue dial, with exhibition glass back. It features the pattented Ulysse Nardin quick set forward and backward for setting the different time zones. Available on a leather strap with stainless steel folding buckle.